Home / Blog / A Very Special Client has Gone Digital this Christmas! Followers of our blog will know that Scan Film or Store has a very special relationship with a certain well known figure very popular at this time of the year. 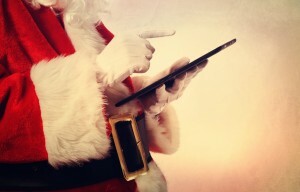 This year we have been working on a top secret project helping him to move his operation into the digital age. For obvious reasons we can’t name names and give too much away but we are sure you will guess who our very special client was from the case study below. Document retrieval, management and storage are key aspects of the day to day running of this factory, with some significant peaks in volumes in the run up to Christmas. The workshop, cupboards, transportation stables and even underneath the beds of the little helpers were overflowing with hundreds of years’ worth of letters. So the big boss finally realised it was time to update the way he manages the millions of letters he receives from children all over the world. This is where our own elves at Scan Film or Store came in and we have worked with his team to implement a document management solution which ensures that all letters received are scanned and stored digitally for when they are needed by the workshop to fulfil orders; no more rummaging through endless sacks of letters. But what to do with the original hard copies was the next problem we had to address. One option was to store them in our secure onsite facility. Our bar coding and cataloguing of all documents would give them the ability to retrieve the originals if needed, even if it would involve a slightly long trip from their headquarters at the North Pole. However, the sheer volume of letters meant that it wasn’t cost effective to keep everything indefinitely so we arranged for the destruction of older originals once scanned. Over the many years that the business has been in operation, a wide range of letters have passed through the factory. Many of these have come from children who have gone on to be prominent figures throughout history and so our brief was to ensure that their Christmas wishes were handled confidentially. Our secure destruction service was the obvious answer. The letters were cross-shredded and then pulped, which is then recycled in the manufacture of soft tissue products. Those letters will stay well and truly confidential and a secret shared between the child and our client. Before destroying the originals we were lucky enough to be allowed to have a look at some of the less confidential ones and our client has kindly given us permission to share them with you. Just email your answers to info@scan-film-store.co.uk before 19th December and all correct answers will be added to a prize draw with the winner receiving a bottle of Champagne to kick off their Christmas Celebrations.